One of the benefits of the cooler months on the Mornington Peninsula this year was a bumper crop of truffles. 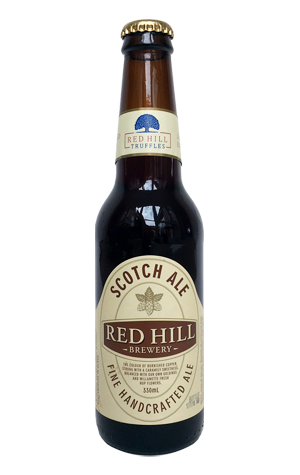 So Red Hill Brewery decided to take advantage, joining their local truffiere at Red Hill Truffles and gathering a few "huge" specimens – $3,000 worth, apparently – to add to a batch of their longrunning staple, Scotch Ale, via a truffle-infused vodka. The original beer is already one with a soft, full and rounded body and here the addition of the truffles seems to have made that even more the case, while adding just the subtlest of earthy aromas and flavours to the beer. As much as anything, this one-off spin on the Red Hill classic is a reminder of just how enjoyable a wintry session beer the caramel/chocolate original can be. We're told if you're after the full truffle experience, head to the brewery itself soon as the brewers added the leftover truffle shavings to casks of Scotch Ale, like dry-hopping, with the impact more pronounced and, once poured through their hand pump, delivering a "very mellow and smooth" experience.